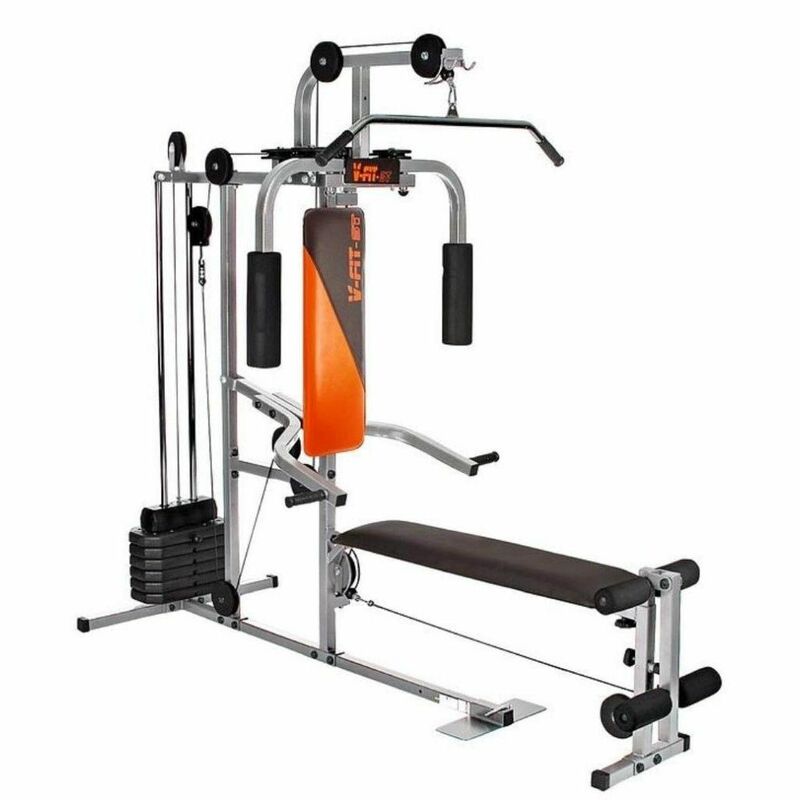 The V-fit LFG2 Herculean Cobra Lay Flat Home Gym features a 31.5kg(69lbs) weight stack which is heavy enough for most beginners and the cable setup provides 64kg(141lbs) of resistance on the bench press. What is more, there are another seven exercise stations, foam rollers and a padded vinyl covered seat and back rest. Frame: 38mm (1.4") square tubular steel main frame. Frame Support: Impact absorbing rubber frame end caps. Frame Finish: Chip resistant, black hammertone epoxy powder coated. Seats and Backrest: Deep padded vinyl (cloth backed) covered seat, backrest and VKR support pads with screen printed v-fit logo. Grips and Rollers: High density expanded foam grips and leg rollers. Resistance System: Unique 'double-up' cable operated system with 7 x 4.5kg (10lbs) aggregate filled vinyl shells. 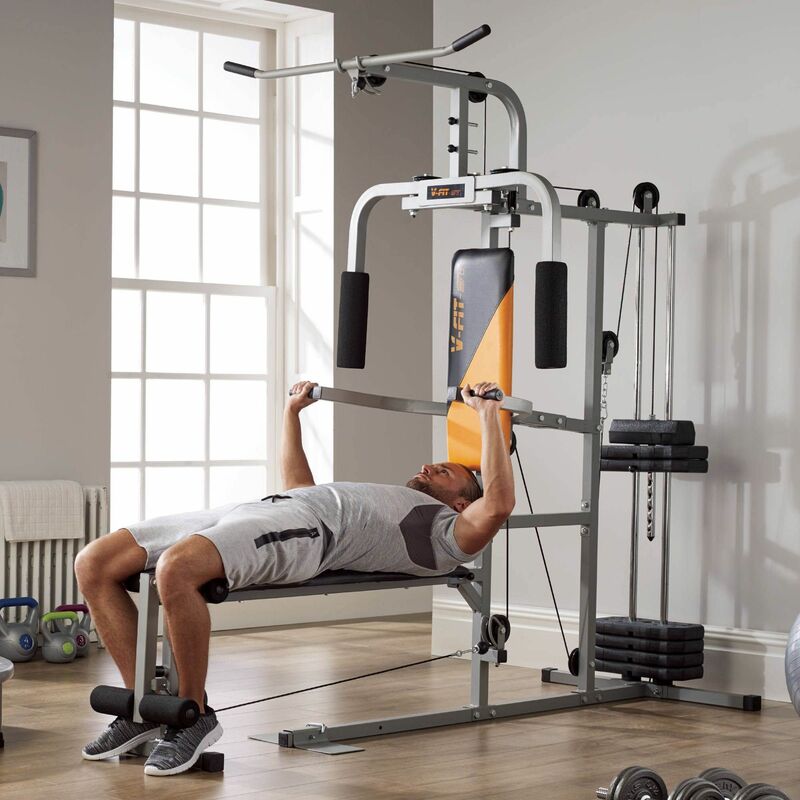 Exercise Stations: Bench Press, Chest Press, Lat Pulldown (Front and Back), Pec Dec, Leg Extension, Back Leg Curls, Upright Rows, Crunches and Sit-Ups. for submitting product information about V-fit Herculean Cobra Lay Flat Multi Gym We aim to answer all questions within 2-3 days. 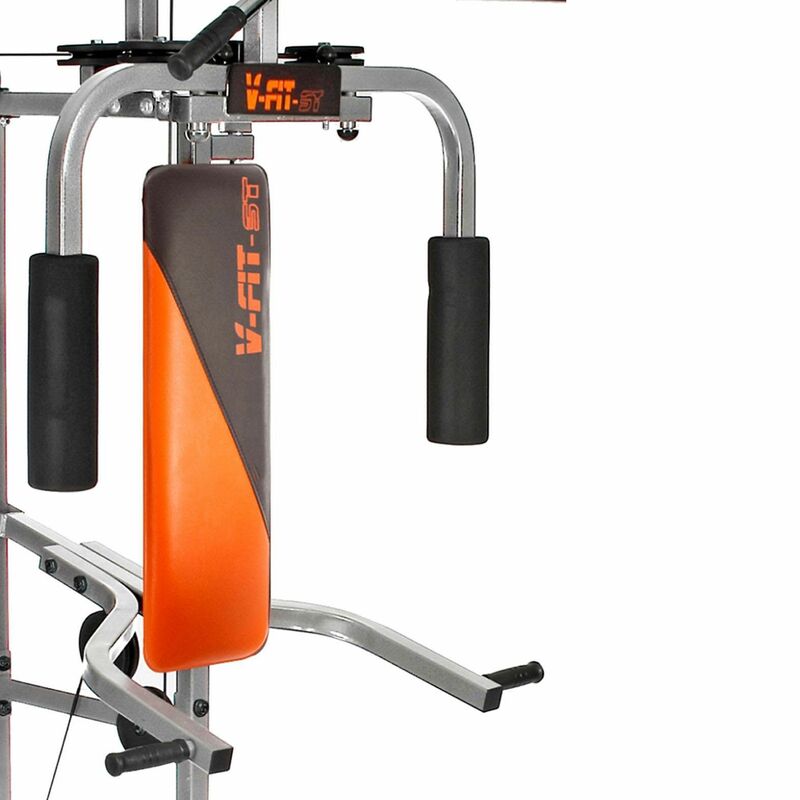 for submitting product information about V-fit Herculean Cobra Lay Flat Multi Gym. We aim to answer all questions within 2-3 days. If you provided your name and email address, we will email you as soon as the answer is published. What are the dimensions when folded please? 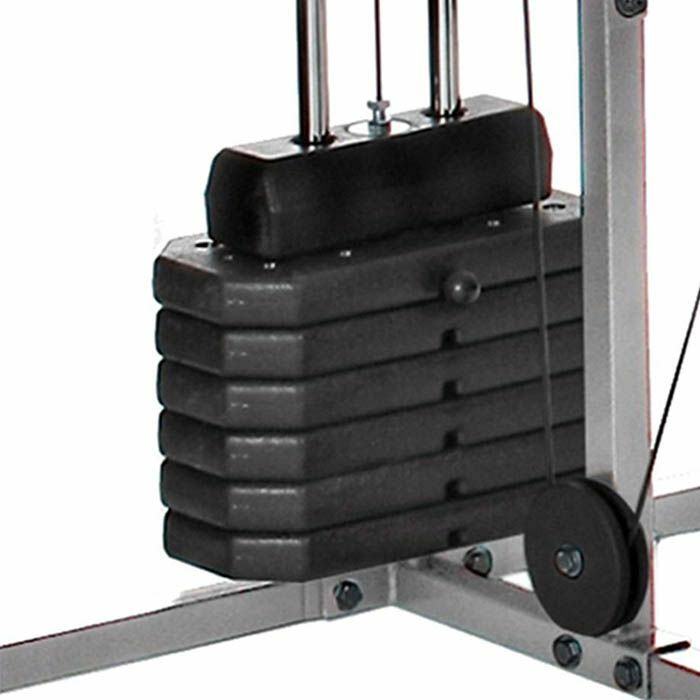 The V-fit Herculean Cobra Lay Flat Multi Gym does not fold for storage. 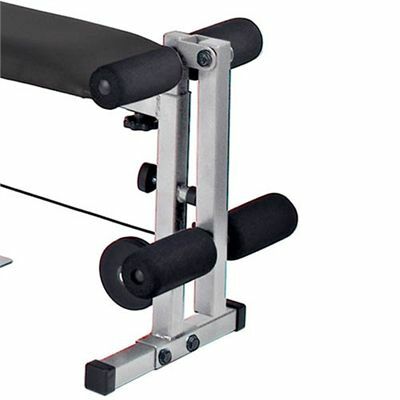 The bench lifts up so you can do more exercises from the leg cable for example, arm curls, leg pulls etc. Do you have to perform any cable changes as you change exercises? No, you do not have any cables. Can you purchase extra weights for it at any stage? 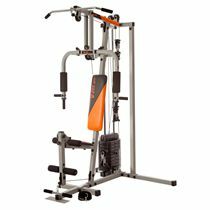 The V-fit LFG2 Herculean Cobra Lay Flat Home Gym features a 31.5kg(69lbs) weight stack which is heavy enough for most beginners and the cable setup provides 64kg (141lbs) of resistance on the bench press. There are no further weight stages that can be added to this product. Good machine - does everything you need it to do and at a much lower price than other machines. Pefect starter multi gym. Came very quickly and not too bad to assemble. Seems solid enough and everything went together as per the instructions. It doesn't have a huge weight stack but that's fine and it's smoother than I thought it would be for this price. for submitting product review about V-fit Herculean Cobra Lay Flat Multi Gym.